WASHINGTON (CN) – The U.S. government requested a warrant Wednesday for a Roman ring its says has been trafficked by the Islamic State group to fund its terror operations. 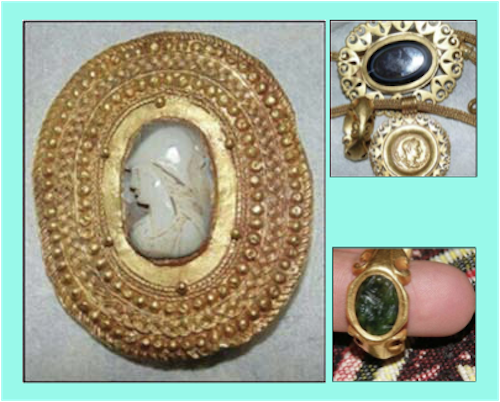 Details on the ring first appeared last year in a forfeiture complaint, and the government says there is probable cause to believe that a Syrian antiquities trafficker sold the gold ring on behalf of ISIS to an individual in Turkey who paid $250,000. Turkish law enforcement have since confiscated the ring, which the government dates back to between 323 and 31 B.C. Along with two gold coins and a rare stone, the ring is one of four archaeological items that authorities found depicted in photographs after a May 2015 raid on the Deir Ezzor, Syria, home of Abu Sayyaf, described in the complaint as the president of antiquities for ISIS. Based on the documentary-style, lighting and focus of the photographs, authorities said Sayyaf prepared the images to market the artifacts internationally. Abu Sayyaf did not survive the May 2015 raid. In addition to now seeking a warrant for the ring, the government has amended its 2016 filing to seek the forfeiture of an additional three items: a gold brooch and and a gold necklace with a matching brooch. The government estimates the value of the first brooch, featuring a cameo of the Greek goddess Athena, at $30,000. The necklace meanwhile features a coin with a bust of Roman Emperor Gordian III facing right and wearing a laurel wreath. Dating the artifact to between 238 and 244 A.D., the government says it and the matching brooch are worth about $50,000 each. All three of the new items are “believed to have been produced in the third century A.D. by the same workshop that supplied similar items to elite residents of the Roman city of Dura Europos,” according to a statement from the Justice Department. The Syrian antiquities trafficker who sold the ring that is now in Turkish hands allegedly trafficked additional antiquities described in the government’s forfeiture complaint. New details on the ring say it came from Deir Azzour, Syria — the same area where Sayyaf lived. On a given sale, Sayyaf is believed to have kept up 20 percent of the proceeds for himself. The government notes that the large swathes of land in Syria and Iraq controlled by ISIS includes multiple UNESCO World Heritage Sites.